Central Greenland reconstructed temperature up to mid-20th century. A rapid cooling around 6200 BC was first identified by Swiss botanist Heinrich Zoller in 1960, who named the event Misox oscillation (for the Val Mesolcina). It is also known as Finse event in Norway. Bond et al. argued that the origin of the 8.2-kiloyear event is linked to a 1,500-year climate cycle; it correlates with Bond event 5. The strongest evidence for the event comes from the North Atlantic region; the disruption in climate shows clearly in Greenland ice cores and in sedimentary and other records of the temperate and the tropical North Atlantic. It is less evident in ice cores from Antarctica and in South American indices. The effects of the cold snap were global, however, most notably in its changes in sea level. The event may have been caused by a large meltwater pulse from the final collapse of the Laurentide Ice Sheet of northeastern North America, most likely when the glacial lakes Ojibway and Agassiz suddenly drained into the North Atlantic Ocean. The same type of action produced the Missoula floods that created the Channeled scablands of the Columbia River basin. The meltwater pulse may have affected the North Atlantic thermohaline circulation, reducing northward heat transport in the Atlantic and causing significant North Atlantic cooling. Estimates of the cooling vary and depend somewhat on the interpretation of the proxy data, but drops of around 1 to 5 °C (1.8 to 9.0 °F) have been reported. In Greenland, the event started at 8175 BP, and the cooling was 3.3 °C (decadal average) in less than 20 years. The coldest period lasted for about 60 years, and its total duration was about 150 years. The meltwater causation theory is, however, thrown into speculation because of inconsistencies with its onset and an unknown region of impact. Researchers suggest that the discharge was probably superimposed upon a longer episode of cooler climate lasting up to 600 years, and it was merely one contributing factor to the event as a whole. Further afield, some tropical records report a 3 °C (5.4 °F) cooling from cores drilled into an ancient coral reef in Indonesia. The event also caused a global CO2 decline of about 25 ppm over about 300 years. However, dating and interpretation of other tropical sites are more ambiguous than the North Atlantic sites. In addition, climate modeling work shows that the amount of meltwater and the pathway of meltwater are both important in perturbing the North Atlantic thermohaline circulation. The initial meltwater pulse caused between 0.5 and 4 m (1 ft 8 in and 13 ft 1 in) of sea-level rise. Based on estimates of lake volume and decaying ice cap size, values of 0.4–1.2 m (1 ft 4 in–3 ft 11 in) circulate. Based on sea-level data from the Mississippi Delta, the end of the Lake Agassiz–Ojibway (LAO) drainage occurred at 8.31 to 8.18 ka and ranges from 0.8 to 2.2 m. The sea-level data from the Rhine–Meuse Delta indicate a 2–4 m (6 ft 7 in–13 ft 1 in) of near-instantaneous rise at 8.54 to 8.2 ka, in addition to 'normal' post-glacial sea-level rise. Meltwater pulse sea-level rise was experienced fully at great distance from the release area. Gravity and rebound effects associated with the shifting of water masses meant that the sea-level fingerprint was smaller in areas closer to the Hudson Bay. The Mississippi Delta records around 20%, Northwestern Europe 70% and Asia records 105% of the globally averaged amount. The cooling of the 8.2-kiloyear event was a temporary feature; but the sea-level rise of the meltwater pulse was permanent. In 2003, the Office of Net Assessment (ONA) at the United States Department of Defense was commissioned to produce a study on the likely and potential effects of a modern climate change. The study, conducted under ONA head Andrew Marshall, modeled its prospective climate change on the 8.2-kiloyear event, precisely because it was the middle alternative between the Younger Dryas and the milder Little Ice Age. Drier conditions were notable in North Africa, and East Africa suffered five centuries of general drought. In West Asia, especially Mesopotamia, the 8.2-kiloyear event was a 300-year aridification and cooling episode, which may have provided the natural force for Mesopotamian irrigation agriculture and surplus production, which were essential for the earliest formation of classes and urban life. However, changes taking place over centuries around the period are difficult to link specifically to the approximately 100-year abrupt event, as recorded most clearly in the Greenland ice cores. In particular, in Tell Sabi Abyad, Syria, significant cultural changes are observed at c. 6200 BC; the settlement was not abandoned at the time. ^ a b Kobashi, T.; et al. (2007). "Precise timing and characterization of abrupt climate change 8,200 years ago from air trapped in polar ice". Quaternary Science Reviews. 26 (9–10): 1212–1222. Bibcode:2007QSRv...26.1212K. CiteSeerX 10.1.1.462.9271. doi:10.1016/j.quascirev.2007.01.009. ^ Zoller, Heinrich (1960). "Pollenanalytische Untersuchungen zur Vegetationsgeschichte der insubrischen Schweiz". Denkschriften der Schweizerischen Naturforschenden Gesellschaft (in German). 83: 45–156. ISSN 0366-970X. ^ Nesje, Atle; Dahl, Svein Olaf (2001). "The Greenland 8200 cal. yr BP event detected in loss-on-ignition profiles in Norwegian lacustrine sediment sequences". Journal of Quaternary Science. 16 (2): 155–166. Bibcode:2001JQS....16..155N. doi:10.1002/jqs.567. ^ Bond, G.; et al. (1997). "A Pervasive Millennial-Scale Cycle in North Atlantic Holocene and Glacial Climates" (PDF). Science. 278 (5341): 1257–66. Bibcode:1997Sci...278.1257B. doi:10.1126/science.278.5341.1257. Archived from the original (PDF) on 2008-02-27. ^ Alley, R. B.; et al. (1997). "Holocene climatic instability; a prominent, widespread event 8,200 yr ago". Geology. 25 (6): 483–6. Bibcode:1997Geo....25..483A. doi:10.1130/0091-7613(1997)025<0483:HCIAPW>2.3.CO;2. ^ Alley, Richard B.; Ágústsdóttir, Anna Maria (2005). "The 8k event: cause and consequences of a major Holocene abrupt climate change". Quaternary Science Reviews. 24 (10–11): 1123–49. Bibcode:2005QSRv...24.1123A. doi:10.1016/j.quascirev.2004.12.004. ^ Sarmaja-Korjonen, Kaarina; Seppa, H. (2007). "Abrupt and consistent responses of aquatic and terrestrial ecosystems to the 8200 cal. yr cold event: a lacustrine record from Lake Arapisto, Finland". The Holocene. 17 (4): 457–467. Bibcode:2007Holoc..17..457S. doi:10.1177/0959683607077020. ^ Ljung, K.; et al. (2007). "South Atlantic island record reveals a South Atlantic response to the 8.2kyr event". Climate of the Past. 4 (1): 35–45. doi:10.5194/cp-4-35-2008. ^ Ehlers, Jürgen; Gibbard, Philip L. (2004). Quaternary Glaciations – Extent and Chronology. Part II: North America. Amsterdam: Elsevier. pp. 257–262. ISBN 978-0-444-51592-6. ^ Barber, D. C.; et al. (1999). "Forcing of the cold event 8,200 years ago by catastrophic drainage of Laurentide Lakes". Nature. 400 (6742): 344–8. Bibcode:1999Natur.400..344B. doi:10.1038/22504. ^ Ellison, Christopher R. W.; Chapman, Mark R.; Hall, Ian R. (2006). "Surface and Deep Ocean Interactions During the Cold Climate Event 8200 Years Ago". Science. 312 (5782): 1929–32. Bibcode:2006Sci...312.1929E. doi:10.1126/science.1127213. PMID 16809535. ^ Matero, I.S.O. ; Gregoire, L.J. ; Ivanovic, R.F. (2017). "The 8.2 ka Cooling event caused by Laurentide Ice Saddle Collapse". Earth and Planetary Science Letters. 473 (5782): 205–214. doi:10.1016/j.epsl.2017.06.011. ^ Rohling, E.J (2005). 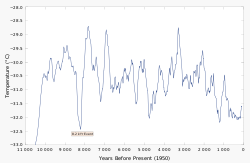 "Centennial-scale climate cooling with a sudden event around 8,200 years ago". Nature. 434 (7036): 975–979. Bibcode:2005Natur.434..975R. doi:10.1038/nature03421. ^ Fagan, Brian (2004). The Long Summer: How Climate Changed Civilization. New York: Basic Books. pp. 107–108. ISBN 978-0-465-02281-6. ^ Wagner, Friederike; et al. (2002). "Rapid atmospheric CO2 changes associated with the 8,200-years-B.P. cooling event". Proc. Natl. Acad. Sci. U.S.A. 99 (19): 12011–4. Bibcode:2002PNAS...9912011W. doi:10.1073/pnas.182420699. PMC 129389. PMID 12202744. ^ Li, Y.-X. ; Renssen, H.; Wiersma, A. P.; Törnqvist, T. E. (2009-08-28). "Investigating the impact of Lake Agassiz drainage routes on the 8.2 ka cold event with a climate model". Clim. Past. 5 (3): 471–480. doi:10.5194/cp-5-471-2009. ISSN 1814-9332. ^ Li, Yong-Xiang; Törnqvist, Torbjörn E.; Nevitt, Johanna M.; Kohl, Barry (2012). "Synchronizing rapid sea-level rise, final LakeAgassiz drainage, and abrupt cooling 8,200 years ago". Earth and Planetary Science Letters. 315-316: 41–50. Bibcode:2012E&PSL.315...41L. doi:10.1016/j.epsl.2011.05.034. ^ Hijma, Marc P.; Cohen, Kim M. (March 2010). "Timing and magnitude of the sea-level jump preluding the 8.2 kiloyear event". Geology. 38 (3): 275–8. Bibcode:2010Geo....38..275H. doi:10.1130/G30439.1. ^ Kendall, Roblyn A.; Mitrovica, J.X. ; Milne, G.A. ; Törnqvist, T.E. ; Li, Y. (May 2008). "The sea-level fingerprint of the 8.2 ka climate event". Geology. 36 (5): 423–6. Bibcode:2008Geo....36..423K. doi:10.1130/G24550A.1. ^ Schwartz, Peter; Randall, Doug (October 2003). "An Abrupt Climate Change Scenario and Its Implications for United States National Security" (PDF). Archived from the original (PDF) on 2009-03-20. ^ Stripp, David (February 9, 2004). "The Pentagon's Weather Nightmare". Fortune. This page was last edited on 20 February 2019, at 07:19 (UTC).